As you all know, the Proton Savvy models offered currently does not have an automatic transmission model. But what Proton is planning to offer to people who prefer the convenience of automatic in a Proton Savvy is not something usual. Normal automatic gearboxes are not liked very much by performance freaks because of it’s big power loss due to the torque converter, and lack of response to the throttle position and shift level changes. The automatic variant of the Proton Savvy will be using something new which Proton likes to call a Automated-Manual Transmission, or Proton AMT for short. This gearbox is basically the Renault Quickshift5 gearbox, which is available in the Renault Clio. After all, the Proton Savvy was loosely based on the Clio. 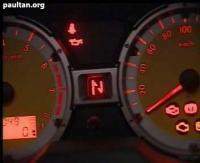 Left: Gear position indicator on the Savvy meter panel. In the manual version that space is blank. Right: The Clio’s Quickshift gear lever. The Renault Quickshift5 is a clutchless manual transmission gearbox. Yes, it works like a manual transmission with clutches and gears, not like an oil-driven automatic with a torque converter. No power loss there. It also has the speedy response of a manual transmission. All of that without the inconvenience of having to press a clutch, especially in traffic jams. The Quickshift5, or Automated-Manual Transmission (AMT) as Proton likes to call it has 5 gears as you would expect from the name. There are 2 modes to it, a manual selection mode where you can switch through the gears sequentially by flicking the gear lever frontwards or backwards. The gearbox was derived from Renault’s normal 5 speed manual gearbox, but an electronic control module was added to it to operate the clutch electronically. The other mode is an automatic mode which shifts gears on it’s own and requires no intervention from the driver. 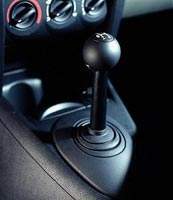 Because the clutch control is computerized with precised timing, shifts are much quicker than any average driver can ever attempt with a normal manual gearbox and foot-operated clutch. The result is a driving experience that’s zippy and fun. The computer features some form of fuzzy logic which allows the auto mode to adapt to your driving patterns. Since the Quickshift5 is derived from a normal manual gearbox, it is lighter than an automatic gearbox thus improving fuel economy and performance. Note: I am basing this blog post on Renault’s Quickshift5 gearbox, which has already been outdated by it’s Quickshift 6 speed gearbox. It is not known whether Proton’s variant of Quickshift5 will have all of the features I’ve mentioned. The Proton Savvy with Quickshift5 is still under testing with Malaysian road conditions. UPDATE: The Savvy AMT has been launched. Details here.